Jim Butcher long ago proved that he had what it takes to write long, complex, but wildly readable series. 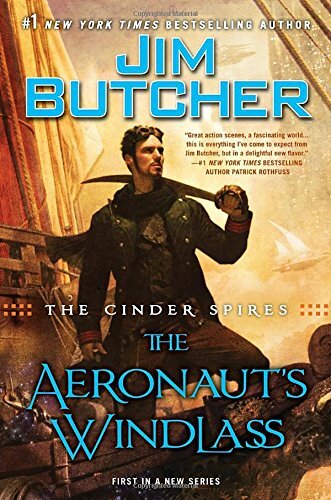 The Aeronaut's Windlass is the start of a new one of wider scope and more detail, and reads like more of an adventure than a lot of the stories classed with it in the category of Steampunk. It is also a new and interesting spin on the genre that takes all the trappings of Steampunk—goggles, copper as the metal of choice, airships—and has them make sense in a new context, so they are not just props and settings like they are in a lot of Steampunk tales, but vital to the story. And he doesn't stop there. The Aeronaut's Windlass is the story of a semi-secret mission to rout out enemy forces that hope to bring down the government of Spire Albion, one of several millenia-old spires full of “habbles”—effectively stacked cities built by mysterious ancient Builders and then populated by and expanded on by humans. A motley team is assembled and sent by the leader of the spire to the economic center of the spire. They find that it's not just an isolated incident that sparked the mission when they uncover a full attack by their greatest rivals from another spire. Their mission goes from a simply finding the enemy to trying to stop a war. Along the way, they find that there's so much more going on than just a simple military strike. With only a handful of untested royal guards, two of whom are still in training, two half-mad etherialists who can control the semi-mystical forces that power their technology, and an assortment of cats, Captain Grimm of the privateer ship Predator and his crew have to stop the utter destruction of their Spire, all the habbles inside it, and the whole of the airship fleet. All they have to work with are their own wits, determination, and personal connections. The leadership doesn't know where there might be traitors, so the mission is unsupported through official means. It's over 600 pages of adventure, and grounded in a detailed and very interesting world, realistic human concerns, and personal battles that shape the movements of the impending war. There's also, as it unfolds, a lot of set up for very interesting future books. There are evil psychics with plans of their own. There's an ancient evil just starting to wake up. There's a barely explored hellish jungle on the surface and thick, thick mists for its monsters to hide in. There's a direct confrontation between two Spires, and no word yet on where the other Spires will align their loyalties. There are pirates and privateers, and a whole fleet full of individual ships and captains—all of which have personal and professional alliances and grudges between them. There are warrior monks. There's mysterious knowledge. There are clans of cats and their feline politics. There's a neat combination of standard Steampunk steam-power with a very well-detailed technology based around etheric-energy-transforming crystals. There are members of families who are born with catlike heightened abilities. There's a barely-examined social structure that looks as complex as the ones in Game of Thrones. And there are a few mentions of archangels with very little to indicate whether they're literal or figurative. What Butcher has done, essentially, is take the visual trappings of Steampunk and make a whole other world that is rather Victorian, but not bound to actual Earth history. It makes sense in ways that a strict reliance on history and science wouldn't allow, opening up all kinds of new story options that Aeronaut's Windlass doesn't hesitate to run with. The story is about the start of a war based on complicated social and trade alliances and grudges, and is handled in such a way that those potentially dry facts are never a drag on the momentum or the clarity of the text. There isn't, yet, much deviation from the traditional white-European sort of setting that Steampunk is known for, but there are hints that there could be in future books, and it would be welcome, as the genre needs it. There are times when the characters seem a little dumb, asking questions they should know the answers to so that the reader can get an explanation of worldbuilding details, but they're not too common or too heavyhanded. For the most part, the characters are very active, decisive, and knowledgeable for a bunch of mismatched very nearly strangers thrown into a situation they were not properly prepared for. There are several well-rounded female characters, as well as interesting male characters, and even a cat who offers a fun and different point of view. One of the best parts of the book are the very well handled airship battles, which are tense and realistic. Butcher's visual writing style shines when describing how the battles happen and progress, and he manages to slide effortlessly back and forth between the big picture of warships doing what they're made for and the actual human consequences. Aeronaut's Windlass is a complete story, with a clear end, and yet it also effectively sets up for so much more action, adventure, and worldbuilding. It's exciting to think what future books could bring.